Manchester United Hold Hirving Lozano in "High Regard"
Mexico star Hirving Lozano scored for El Tri during the international break against Chile in San Diego, CA. 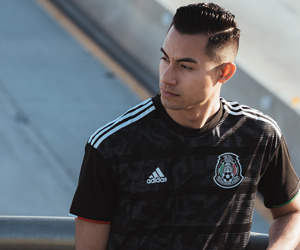 To the tune of “El Chucky Lozano” chants rocking SDCCU Stadium, it’s clear the 23-year-old is quickly becoming Mexico’s next super star. That honor currently belongs to Mexico’s all-time leading goal scorer Javier “Chicharito” Hernandez but “El Chucky” is quickly ascending to that mantle. Since leaving Pachuca, Hirving Lozano has taken the Eredivisie by storm with PSV Eindhoven winning the Dutch league in his first year with a grand total of 17 goals and 11 assists. He’s following up his sophomore season spectacularly with 15 goals and six assists in all competitions catching the attention of major clubs. Napoli, Arsenal and Manchester United are just some of the major clubs interested in acquiring the speedy winger. The Serie A club has been linked the most with the Mexican but Manchester United may be in line to hijack that move. According to Pachuca’s Sporting Director Marco Garces (via Goal), Man U has been keeping tabs on Lozano since before he left the Liga MX club. “I can’t say anything exact on Hirving’s future, as he will have to decide with his attorney and his family, who I know have always been influential in his decisions,” he told Italian publication Gonfialarete via Goal. Similar to Chicharito, “El Chucky” could make the summer move to Manchester United to lineup alongside Paul Pogba, Anthony Martial, Marcus Rashford and Romelu Lukaku. It would be a huge move for Lozano to make the jump from the Dutch league to the Premiership and join the 21-time Premier League champions. He would add more attacking flair to Ole Gunnar Solkjaer’s squad. Lozano paired with Rashford and Martial would form a fearsome triumvirate with tremendous speed on the wings. In addition, they would be quick to jumpstart a counter attack for the Red Devils front line. In the end it’s all hearsay until pen is put to paper on a contract. Hirving Lozano to Manchester United would be great for the Mexican National Team, as it would slot one of its well-known players on a top-notch club. In addition it would challenge Lozano in a much better league with other world class players.